Image: Rawpixel/Getty Images. Design: Ashley Britton/SheKnows. “I’d like my files transferred, please,” are words I could not have imagined uttering in 2010 after having just been diagnosed with breast cancer. I had spent hours researching, looking for the right oncologist. After reading numerous reviews and top-doctor issues, I had settled on an oncologist whose office was blocks from my apartment. Convenience was key in the early stages of my diagnosis; everything at that point seemed difficult and inconvenient. 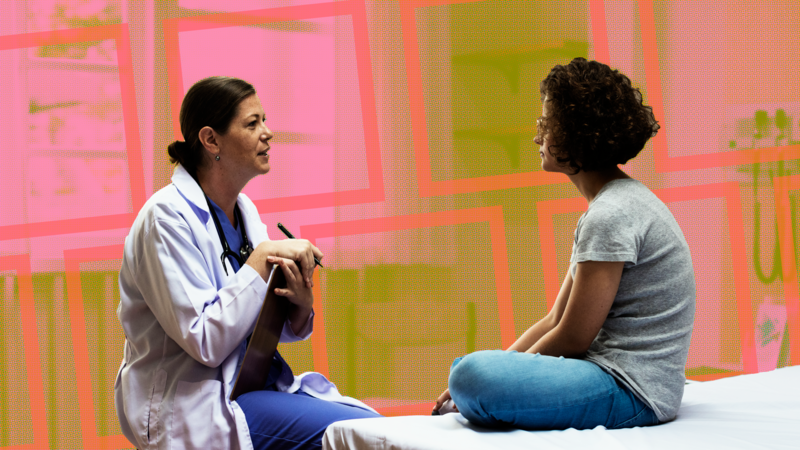 Scheduling tests, finding physicians — it was all exhausting. It was a relief to find an oncologist that not only came recommended, but was also within walking distance. While there is a team of people who are tasked with saving your life after being diagnosed with cancer, it’s the oncologist who creates your cure. In my circumstance, it was the biopsy that found the cancer, the breast surgeon who took out the cancer, the plastic surgeon who fixed my body after the cancer was physically removed — and it was the oncologist who made sure every cancer cell died a swift death, then developed a plan post-chemotherapy that would reduce the chances it would make another appearance. The first meeting with my oncologist was overwhelming to say the least. He asked me to tell my story from the beginning: from the sonogram that led to a mammogram that led me to this office, where I sat notebook in hand ready to take notes about a disease that up until about a month prior, I had superficial knowledge of. He was precise, his words deliberate. He used technical terms when he needed to and explained the process step-by-step. When he sensed I was approaching total brain overload, he closed my file and said: “That’s enough for today. Take some time, digest what we just went over, and I’ll see you next week.” It was the first appointment that I had been to where my doctor had taken my fragile state into account. I felt relieved. Together, my oncologist and I tackled my breast cancer with a strong cocktail of chemotherapy. He was scientific about my treatment. “When you complete these 12 rounds, your cancer will be gone,” that was his job after all — to get rid of the cancer. While he was right — the medicine worked — so did everything else. Through cold-cap therapy, I was able to conserve my hair during treatment, when in reality, I should have been bald after round three due to the side effects of the chemo. My extremities should have been numb. My mouth should have been riddled with sores, but that wasn’t the case due to all the alternative avenues I explored during treatment. While I was glad he had been open to me trying new therapies, there was always a part of me that had wished he had been a little more open to many of the therapies that, today, are considered a no-brainer. After graduating from chemotherapy and given the all clear, I was downgraded to seeing my oncologist every six months for blood work and to check in, but I found that at each of these appointments, our interactions got less and less thorough. I would approach him about tests and scans that I felt I’d like to undergo and was met with a "Why would we do that?” attitude. My concerns about remaining vigilant about scanning for signs of any recurrence were brushed off. I grew annoyed with his reluctance to write up orders for these tests; I would leave his office, which had since moved outside Washington, D.C. to the suburbs of Maryland, frustrated. My last appointment with my oncologist was in August of 2018. I had just walked over a mile in the 95-degree D.C. summer (so 106 with humidity) from the metro to his office. I arrived irritated and sweaty. Our appointment included the standard blood work and checkup, but that was it. I had things to discuss with him, but in that moment no longer felt like he was the right person to answer them. I was ready to move on. I've since learned that making a move after so many years isn’t that uncommon. When I called one of the new offices I was interested in learning more about, it seemed pretty routine; call your old office, ask for your files to be transferred, wait for the new office to call to schedule an informational appointment.